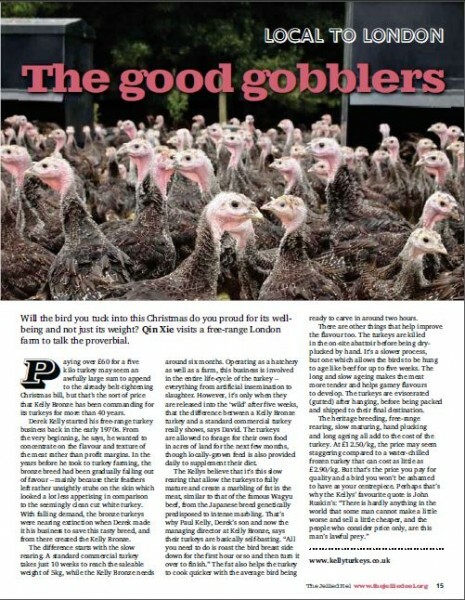 Will the bird you tuck into this Christmas do you proud for its wellbeing and not just its weight? Qin Xie visits a free-range London farm to talk the proverbial. Paying over £60 for a five kilo turkey may seem an awfully large sum to append to the already belt-tightening Christmas bill, but that’s the sort of price that Kelly Bronze has been commanding for its turkeys for more than 40 years. Derek Kelly started his free-range turkey business back in the early 1970s. From the very beginning, he says, he wanted to concentrate on the flavour and texture of the meat rather than profit margins. In the years before he took to turkey farming, the bronze breed had been gradually falling out of favour – mainly because their feathers left rather unsightly stubs on the skin which looked a lot less appetising in comparison to the seemingly clean cut white turkey. With falling demand, the bronze turkeys were nearing extinction when Derek made it his business to save this tasty breed, and from there created the Kelly Bronze. The difference starts with the slow rearing. A standard commercial turkey takes just 10 weeks to reach the saleable weight of 5kg, while the Kelly Bronze needs around six months. Operating as a hatchery as well as a farm, this business is involved in the entire life-cycle of the turkey – everything from artificial insemination to slaughter. However, it’s only when they are released into the ‘wild’ after five weeks, that the difference between a Kelly Bronze turkey and a standard commercial turkey really shows, says David. The turkeys are allowed to forage for their own food in acres of land for the next few months, though locally-grown feed is also provided daily to supplement their diet. The Kellys believe that it’s this slow rearing that allow the turkeys to fully mature and create a marbling of fat in the meat, similar to that of the famous Wagyu beef, from the Japanese breed genetically predisposed to intense marbling. That’s why Paul Kelly, Derek’s son and now the managing director at Kelly Bronze, says their turkeys are basically self-basting. “All you need to do is roast the bird breast side down for the first hour or so and then turn it over to finish.” The fat also helps the turkey to cook quicker with the average bird being ready to carve in around two hours. There are other things that help improve the flavour too. The turkeys are killed in the on-site abattoir before being dry-plucked by hand. It’s a slower process, but one which allows the birds to be hung to age like beef for up to five weeks. The long and slow ageing makes the meat more tender and helps gamey flavours to develop. The turkeys are eviscerated (gutted) after hanging, before being packed and shipped to their final destination.